Old map by JAILLOT - L'Afrique divisée suivant l'estendue de ses principales parties ou sont distingués les vns des autres . . . Title: L'Afrique divisée suivant l'estendue de ses principales parties ou sont distingués les vns des autres . . . Size: 21.7 x 34.6 inches. Condition: Printed on two joined sheets. Some minor spotting. Left and right margin cut into neat line. Paper thinning along center fold. Old folds. Else a good dark impression. A second state of this fine mile-stone map of Africa with a decorative title and scale cartouche. As the title indicates, this map is based on the geography of Guillaume Sanson (1633-1703), in this case his map of 1668. 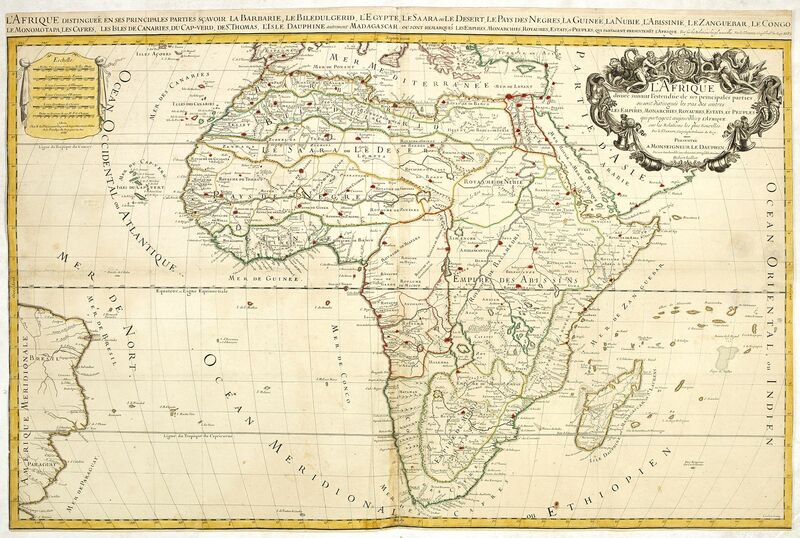 The map present the Empire des Abissins (Abyssinia) as cextending far to the south of the Equator. The name of S.Laurens is re-introduced for the island of Madagascar. The fictitious island of St. Helenaz nova is still on the map in the South Atlantic. 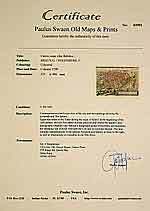 A newly engraved Dutch counterfeited edition of the ' Atlas Nouveau', was published by Pieter Mortier in Amsterdam.